For new skid designs a dynamic analysis is often required to resolve a vibration problem. 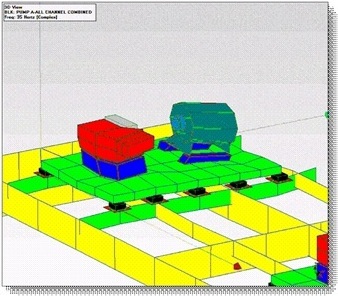 In addition to the dynamic analysis, other design criteria must also be addressed. The skids must be designed to avoid resonance and vibration (from dynamic machinery and unbalanced forces and couples). The industry is looking for lower cost packages. This can cause suppliers to reduce the skid cost which often results in detrimental decrease in skid stiffness. But an inappropriately designed skid will create vibration and reliability problems. In some cases, skids are considered too flimsy for the required application. New designs must consider loading, lifting and transportation issues, as well as weight limitations. Pedestal height can also cause problems. Environmental loads such as wind, wave, and seismic activity must meet a variety of different codes and standards. These two animations are examples where the skid was resonant and created severe vibration problems. The animations are called operating deflection shape (or ODS) and are based on field vibration measurements. An ODS is helpful to understand the relative vibration and even the mode shapes. 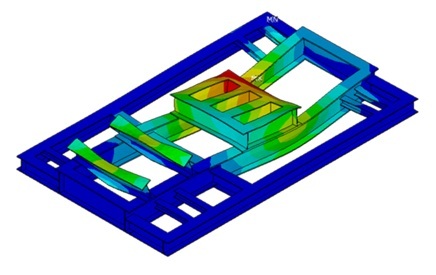 These examples illustrate why a dynamic skid analysis is often required. The picture on the right illustrates the modifications required to adequately support the engine (shown in yellow). This solution has resolved the vibration problems. Two commonly required skid studies are performed to address the above challenges. These engineering requirements must be specified (by the owner or EPC) to ensure they are included in the project. Lifting, Environmental, and Transportation Studies. These studies will ensure the skid can be lifted, transported to site, and withstand environmental loads such as those induced by the wind or an earthquake. Skid applications will need to meet industry codes and customer specifications for these loads. 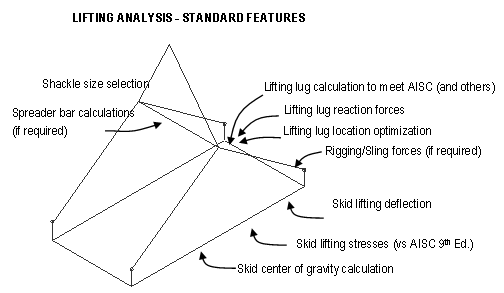 Dynamic Skid Analysis. The study is focused on rotating or reciprocating machines. It will assess the vibration and dynamic stress amplitudes in the skid structure and components mounted on the skid to identify if modifications are required. 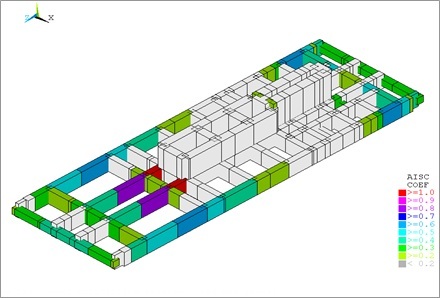 For many packagers, Wood can also help reduce the cost of the skid (Skid Optimization Study). Contact us for further information on ways to reduce unnecessary costs (labor and materials). 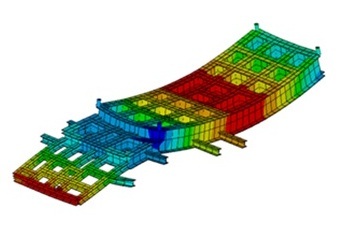 Note that the final skid design is affected by the compressor foundation design (i.e., the dynamic stiffness will vary depending if a concrete, gravel, steel structure or pile foundation is supporting the skid). Evaluate the skid design to ensure the skid member stresses are below appropriate code specifications such as the AISC requirements. Other lifting standards may also apply for offshore platform or FPSO applications (such as API RP-2A-W5D). 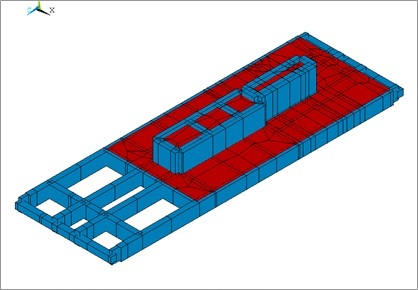 Evaluate skid design based upon lifting loads, transportation and hold-down requirements, and environmental loads such as wind, seismic activity, motion and/or inclination of skid in FPSO or offshore applications. Skid deflections due to lifting are compared to industry or customer specifications. Skid lifting lugs are appropriately sized. The center of gravity is calculated. Spreader bar and shackle design are recommended. 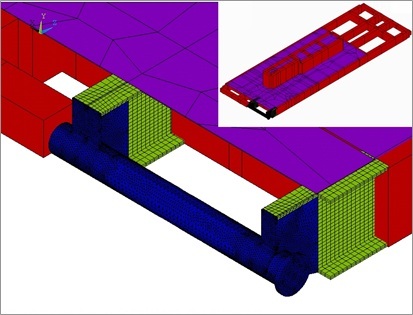 As an option, Wood can perform anchor bolt loading and a Finite Element Analysis (FEA)to evaluate localized skid flexibility, gusset and equipment mounting design. Report includes proposed modifications to the skid design and a summary of the applied loading and calculated results. 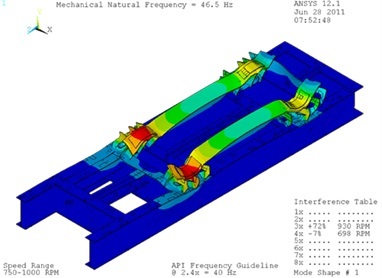 Examples of FEA models used in the dynamic skid analysis to avoid resonance and vibration problems. For reciprocating machines, the dynamic loads include unbalanced forces and moments, cross-head guide forces, gas rod load forces, pulsation induced forces in piping and vessel, and unbalanced forces and moments in the driver. 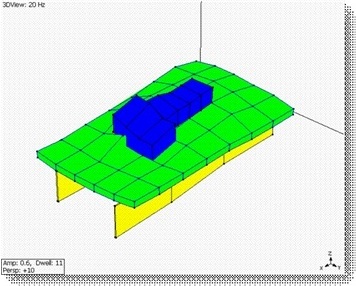 Calculate skid vibration and stress and compare to industry or customer guidelines. Consider boundary conditions from the foundation (pile, gravel pad, concrete block or steel structure). All compressor operating forces are applied vectorially to the model as dynamic loads. 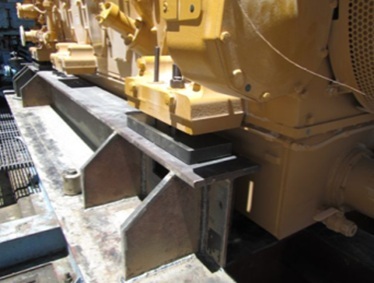 Vibrations and stresses are calculated for each load step and operating case. Engine unbalanced forces and moments are added to the operating load. Compressor gas forces and cross-head guide forces are calculated by Wood and applied to the FE model as a dynamic load. The appropriate damping ratio is applied based on Wood’s field experience. Design modifications are provided where vibration or stress exceeds guideline. If required, Wood can calculate stresses on the skid welds and compare to allowable limits. Report includes recommendations for the skid design and a summary of the applied loads and results (calculated mode shapes, MNFs, and vibration amplitudes). Skid design will comply with international standards (ABS, API, AISC) and customer specifications. Ensure safe lifting, transportation, and operation. Optimize skid costs by reducing unnecessary equipment and modifications. Ensure sufficient stiffness (at key locations) to avoid vibration problems for components mounted on the skid.